Having not posted since December and revising the parts of The Prodigal Band that will be included in my forthcoming e-book, the all-inclusive The Prodigal Band Trilogy, I have completed the proofread and edits using large PDF printing through Word’s export mechanism. One final read-through is on the way and I’ll be sending the completed manuscript to Lulu later this week. Because I just completed the hardest part of the job–the cover art. 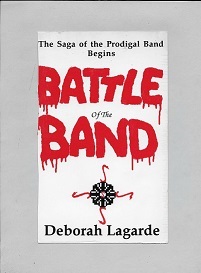 Now I used to be an artist of sorts: I’ve done paintings, silk-screens, airbrush including t-shirts, and drawings, and created the covers for Battle of the Band and The Prophesied Band print editions in 1996 and 1998. In a day and age when “it’s all about the money,” this is not a good time-frame to be using photos or artwork one did not create oneself. So I went through my entire “pictures” folder of photos taken by me or a loved one on various vacations from cruises to boat rides to graduations to camping trips to whatever and I finally found a photo I took in summer of 2009 at San Antonio’s Sea World at night during a fireworks display. Since the ‘three-books-in-one’ book is about a rock and roll band’s journey to righteousness and victory over evil, I wanted my cover art to feature a bright and overwhelming light above the darkness, and what better image than a fireworks display? Plus there is a pond or water at the bottom of the photo, which represents the “sea” in the Book of Revelation which stands for “the nations.” So, I chose my photo. Then the problem happened. The photo I chose had 180 dpi, or dots per inch. Lulu’s book packages, as well as self-publishing, requires 300 dpi or greater! Now I had two photos from Pexels (I think) on my computer with 300 dpi, and ALL of my self-produced or family-produced photos were or 180 dpi or less. Most were less than 100! So, what was I supposed to do while NOT using a Pexel stock photo, or PAYING Getty Images over 100 dollars for ONE STINKIN’ PHOTO? (Because Getty Images requires one to get the usual “premium” pay-to-play account and pay them about 100 dollars when all I needed was one photo! Heck, I have already paid Lulu 800 dollars to assure my book would be distributed over several markets! Because I hate to say it, but if you want results more often than not you must “pay to play.” Because “pay to play” is becoming SOP on the internet! But then I became the “me” I am and figured–why can’t I turn some photo I am editing in Microsoft Paint into a 300 dpi photo? Believe it or not, one can use Microsoft’s free Paint accessory program to turn any photo in your photo library into a 300 dpi cover art. And here is what I did. First I recording the pixels for height and width for the photo I wanted to increase the dpi on. One can find this info out by right-clicking on the photo in question, left-click on “properties,” at the bottom of the menu, then left-clicking on details, which shows the pixels for height and width as well as dpi. Jot down the width and height pixel numbers, then open the photo you want to increase dpi for, in Paint, by clicking “Open with” and then choosing “Paint.” Make sure the photo is saved in JPEG or .jpg format! And, while that file is still open, do the same with any file you have in 300 dpi, any 300 dpi photo you have in your library (if you don’t have one, go to Pexels and download one!). Before the edit, though, make sure the 300 dpi photo you will edit has the SAME PIXELS, width and height, as the photo you will paste into it! If not, it won’t work! And what you are going to do is “edit” that 300 dpi photo by copying the photo you want to increase the dpi for and then pasting it in the 300 dpi photo file! Now your original less-than-300-dpi photo (with the same number of width and height pixels) is a 300 dpi photo! All you have to do after that is change the file name when saving it. To make sure you did it correctly, go here and check their instructions. And you don’t have to be a good photographer to create your cover art. I should know–I am not a good photographer! Note that I should have everything for the e-book ready by the end of the week. 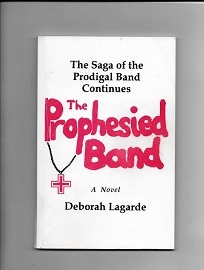 Previous Previous post: Forthcoming: The Prodigal Band Trilogy-Combined E-book for Sale! And Happy New Year to All Downloaders of My FREE PDF “The Prodigal Band”!